Growing up in a Maasai community we are blessed to always be around wildlife. At night, you’d hear the hyenas howling or the lions roaring. Sometimes elephants would come so close you’d hear their stomachs rumbling! And there were so many wildebeest, because we lived right on their breeding ground: huge herds and their calves.I was fortunate enough to go to school, but during the holidays we went up country to my grandmother. Just remembering those days it’s taking me back. We went to fetch firewood, we went to fetch water, we would do the house chores, taking branches off trees and sweeping my auntie’s and my grandmother’s house. There was waking up in the morning, there was milking, there was taking care of the sheep. Best of all was learning how to construct a Maasai house, the traditional manyatta. We used to help my aunties do the mudding. 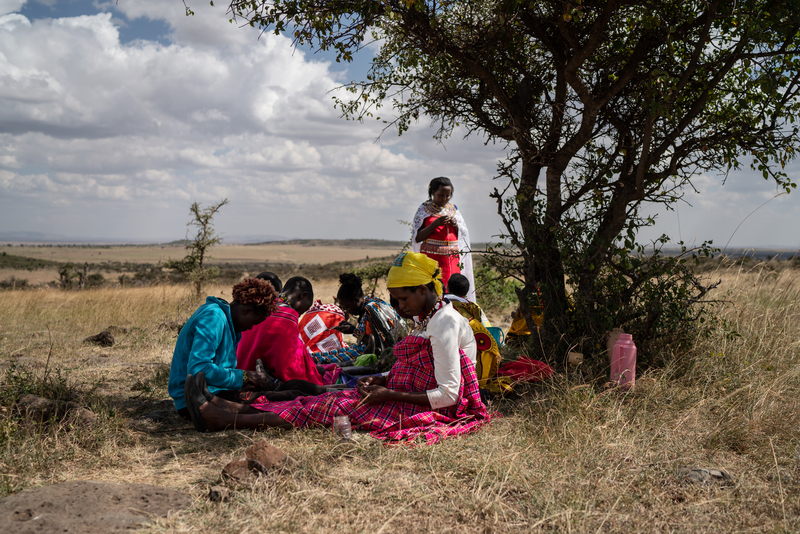 We would go get the soil, collect the cow dung and mix it all up, and they would allow us to mud the houses together with them.After we’d done the chores, all our aunties just gathered in the afternoon, sitting chatting, beading. Me and my cousins we were always there to pick up any beads that got dropped. We would collect them into our own little cans. When we had free time we’d try to make jewellery. My mum noticed that I had the interest in beadsand she strived to nurture the talent. She’d buy me extra beads to play around with. 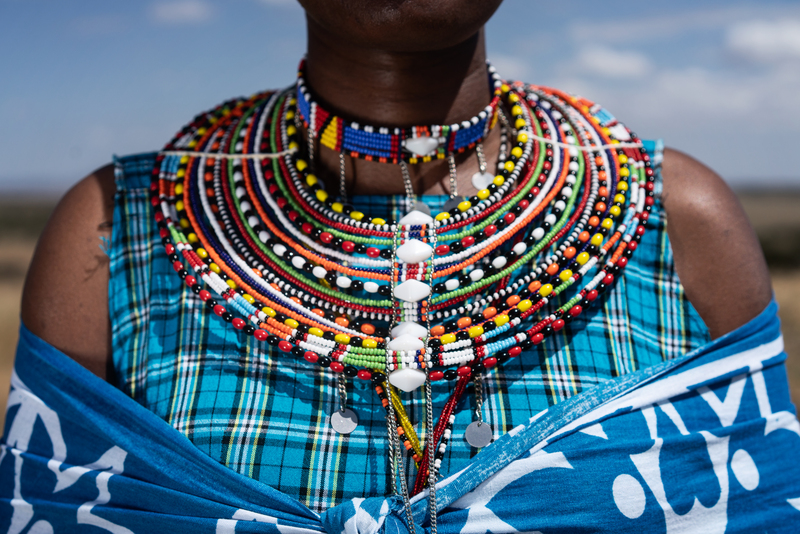 Beadwork is a very special skill to the Maasai ladies. Mothers would train their girls to master the craft so that it’s passed down from one generation to the next. After primary school, I went to secondary school, then to university. But still during the holidays one of my hobbies was beading. I never thought that one day, beadwork is what would get me a job. Nowadays I work in Community Development, heading up the Maa Beadwork project. We have 494 ladies from the community working with us. 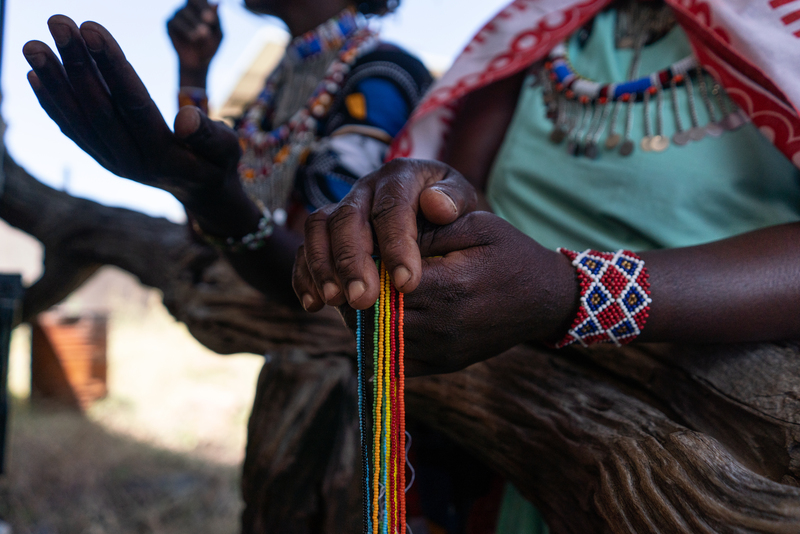 We help them find markets for their beadwork, providing an independent source of income to support their families. I also work with them to understand what our clients want and come up with new designs. We have our outlet shop where tourists can watch the ladies beading and see my colleagues at the leather department cutting. They get to experience the whole production process. I always wanted to come back here after university. I was so glad when I got this opportunity to establish Maa Beadwork from the ground up. The first time I met with the ladies, they gave me the best reception. It was the most humbling experience. They were just sitting under a tree and as I went and sat down they were so glad. They said: “Wow, it’s so nice that we have one of our very own girls whom we’ve worked so hard to take to school and now they’re coming back to work with us.”Ever since it’s been a joy to work with them, they’re the most welcoming people, they’re the most hospitable people, they’re the most trustworthy. They’re so trusting and what we’re doing now is to make sure that we give them the best that they deserve. Drawing blood without doing harm. Cows carry deep associations with home for the Maasai. In traditional villages they’re not just a source of wealth, they also provide sustenance -in ways you might not expect. ●The day begins before sunrise in the Maasai village. Beatrice makes tea for breakfast over an open fire. ●At night the cattle are herded into the village compound to keep them safe from wild animals. ●Before the cattle are taken out to pasture by the menfolk, the women round them up for milking. .●Today they are taking blood from one of the cows too. Blood from the livestock is an important source of nourishment. ●A bow and arrow is used to put a small incision into the cow’s jugular vein. ●Beforehand the arrow is sharpened to make sure it causes no pain as it goes in. ●They know exactly how much blood it’s safe to take. It’s mixed with milk and given to people who are sick and women who have recently given birth. ●For the rest of the day the menfolk allow the cattle to graze on the plains. Edward is taking his turn to keepwatch for wild animals.